Previously I’ve written about my favorite supplies, but when it comes to travel- especially international travel, the rules are different! 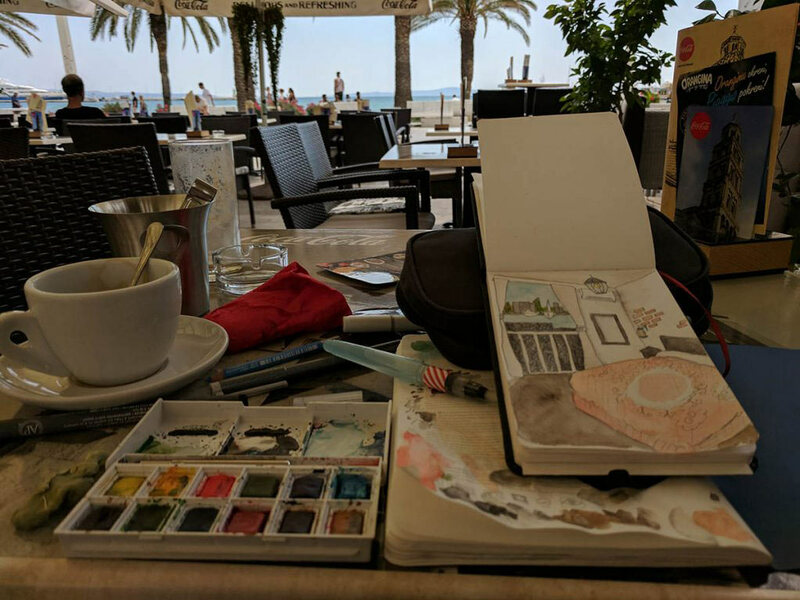 In July 2017 I set off on a 25-day solo trip journeying from iconic spots in Italy, across the Adriatic and down the Croatian coastline and venturing into the mountains of Bosnia and Herzegovina. My itinerary and a recent back injury demanded I pack light, but my excitement about travel journaling meant packing art supplies. 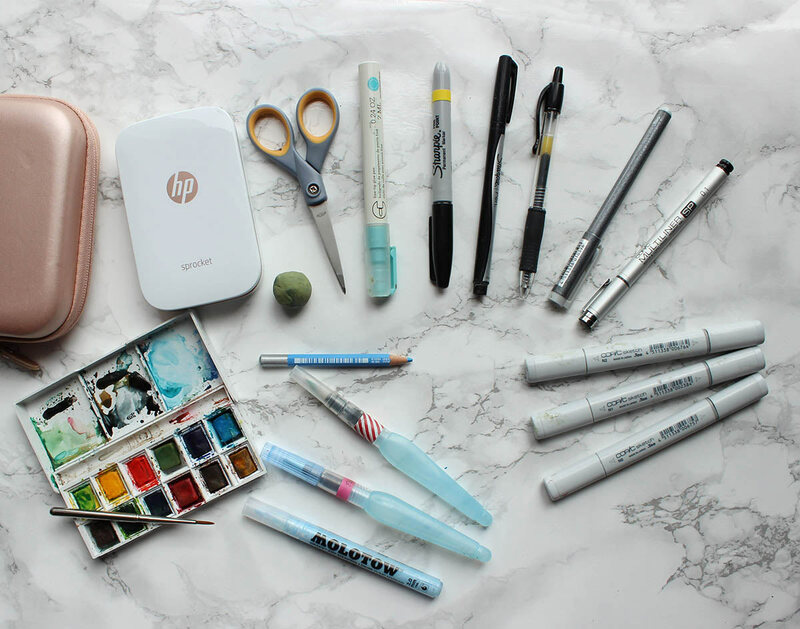 Below is my list of “Must Have” art supplies for travel journaling- Together, they form a kit that’s compact and lightweight- It’s got all the travel journal essentials without the waste of unnecessary or oversized items. I’m devoted to this Portfolio Style Pen Case because 1. it has a massive capacity but small size, 2. it zips easily even when stuffed, and 3. it unzips to flat, with a “centerfold” of pockets, making it really easy to keep all supplies at hand even if I’m sketching on my lap or a small bistro table. 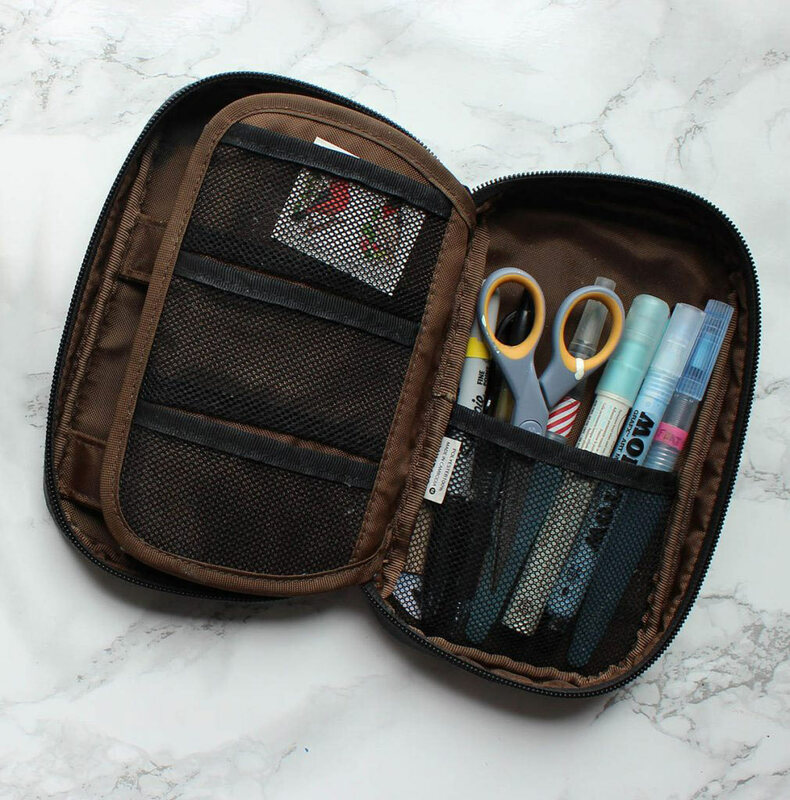 A pen case with pockets is essential and prevents everything from falling out at once if the case is dropped or overstuffed. I do all my primary sketching with a non-photo blue pencil. 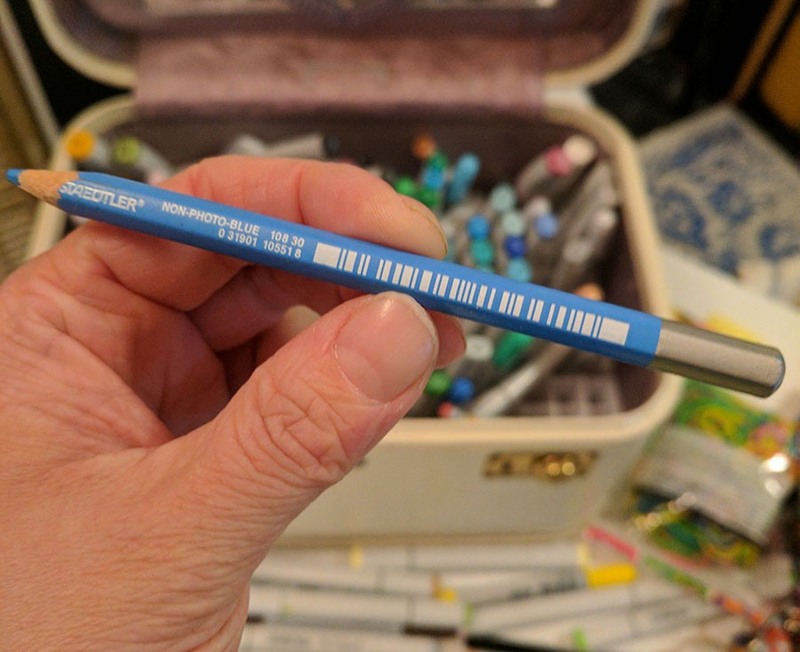 These were popularized back in xerox-days when the color wouldn’t reproduce, and at home they’re still good way to move your art to computer without the hassle of erasing (just drop the blue channel once scanned) but I love them because they don’t smear like graphite pencils and because they always erase clean. It’s so helpful to have a small pair of scissors while traveling. Just make sure the blades are under 4″ and you should be able to clear TSA security even if they are sharp. Pair these little scissors with a glue pen, and you’ve got an easy way to cut receipts, tickets, brochures, etc down to size and add to the pages of your travel journal. multiliners are a little better for precision, but I write with enough pressure that I self identify as a nib-smasher, so Sharpie’s cheap disposable Fine Tip Pens work well for me with no smudging. 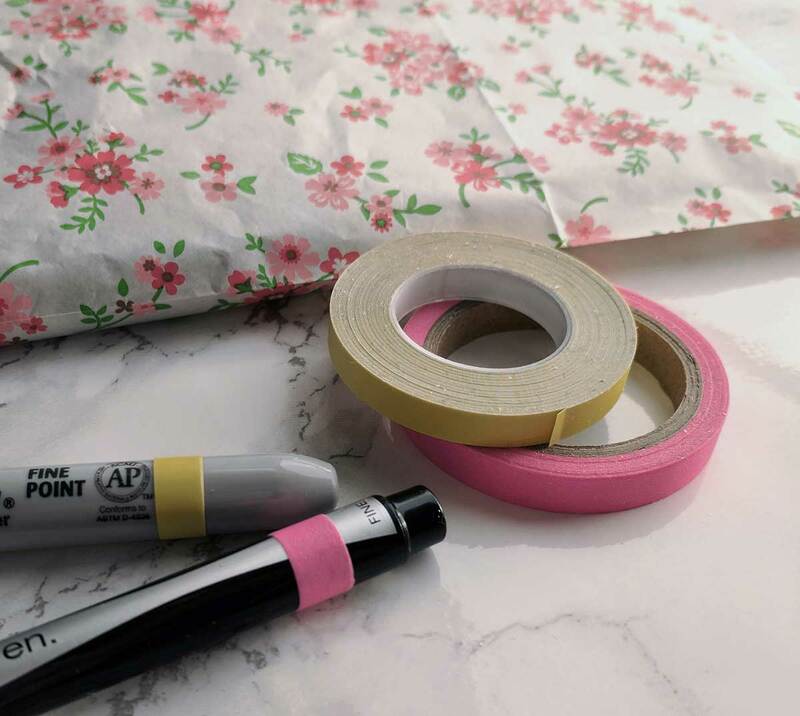 Bonus Tip: When you buy new soft-tip pens, wrap the end with washi tape. As you use them, the first time you notice a pen writing not-quite-as-smooth due to a worn nib, remove the tape. This system helps make sure I’m using my best pens for art and not-so-perfect pens for normal writing. Mark new pens with tape, so you’ll know at a glance which have full ink and fresh nibs. Way, way better than a glue stick to apply glue precisely, this pen stays in my bag 365 days a year. 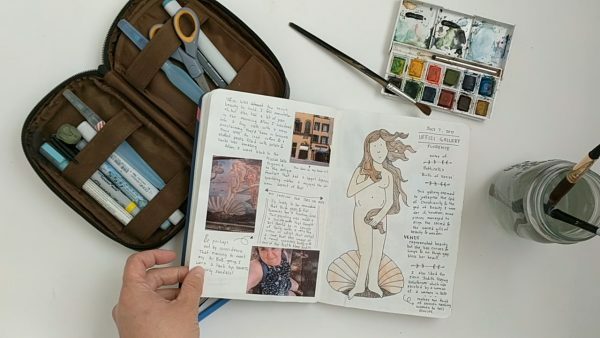 It’s the best for creating mixed-media journal entries on the go. I picked up this 8. 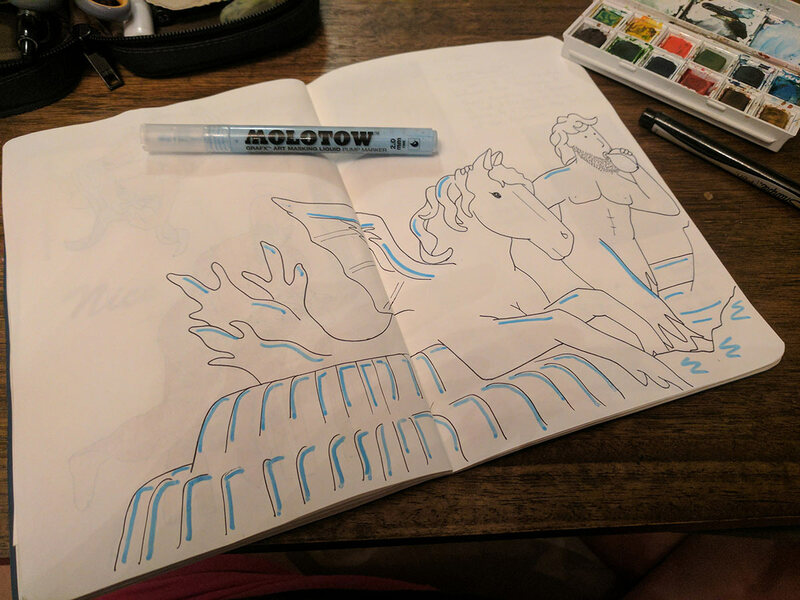 Molotow Masking Pen on a whim in a tiny art supply store in Rome, and when I returned to the states I started seeing it in all the art stores- for nearly 3X the price! Don’t get duped- Amazon has it for half the price of art stores in Seattle! A masking pen allows you to, before you start painting, place a thin waterproof barrier over sections of your art that you want to remain white. Once the fluid dries (about 1 minute) you can paint like normal, then when your paint dries the dried fluid rubs off revealing solid white. This was perfect for painting seas and fountains on the road. 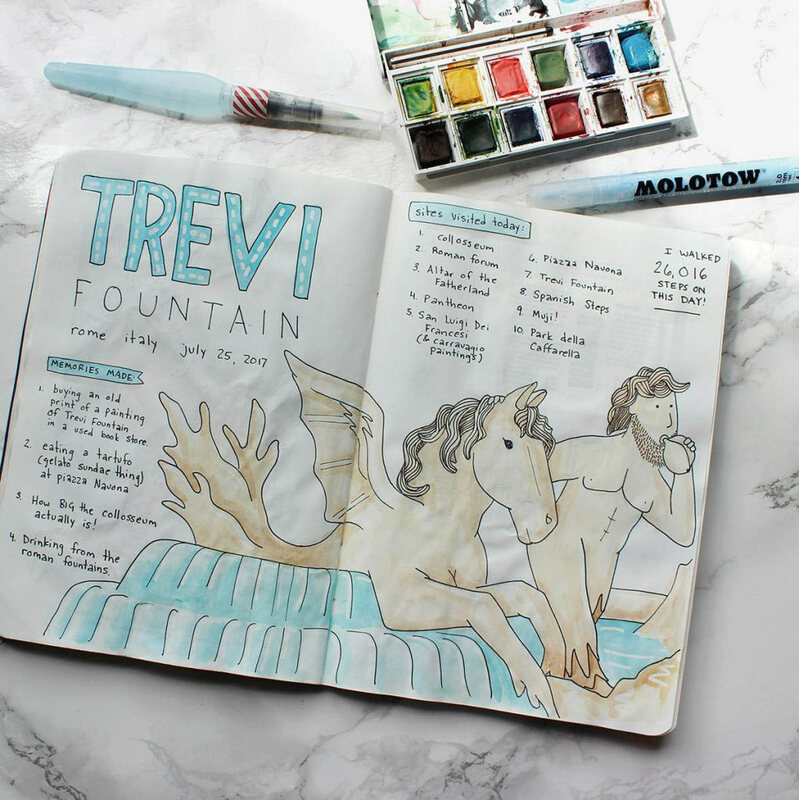 There is a bit of a learning curve so be sure to read my Tips for Using Molotow Masking Pens. I couldn’t sleep on my overnight ferry to Zadar, Croatia, so instead, I printed photos from the previous few days for my journal. My biggest art investment for my Croatia trip was a winner. 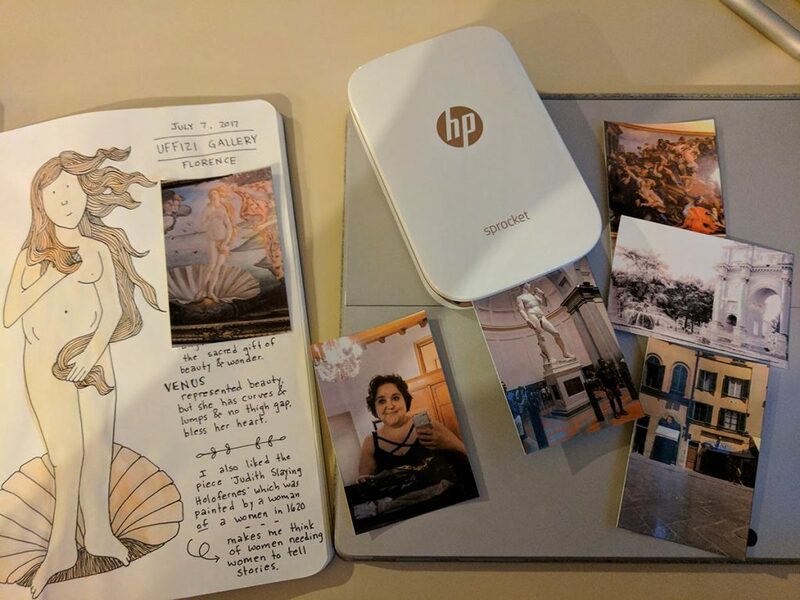 I am the WORST at editing photos and printing photo books after a trip so for my Summer 2017 travels I decided to try HP’s portable bluetooth Sprocket printer- a printer that prints photos from my phone. I LOVE it. It’s not something I need to carry daily at home, but I’ll never take an international trip without a portable printer. It was lovely to be able to print selfies from exciting moments, print shots of the scene I’d just sketched, or (my favorite) print a photo of my painting held in front of the scene I’d drawn. The Sprocket prints photos with a peel-and-stick back, which was extra convenient. 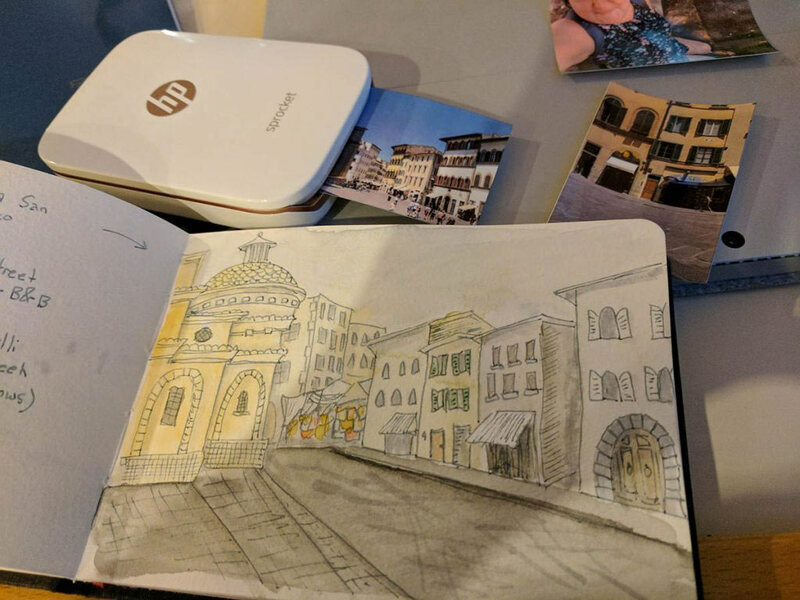 A travel printer is an extra bonus if you are strictly a travel journaler rather than a travel art-journaler. 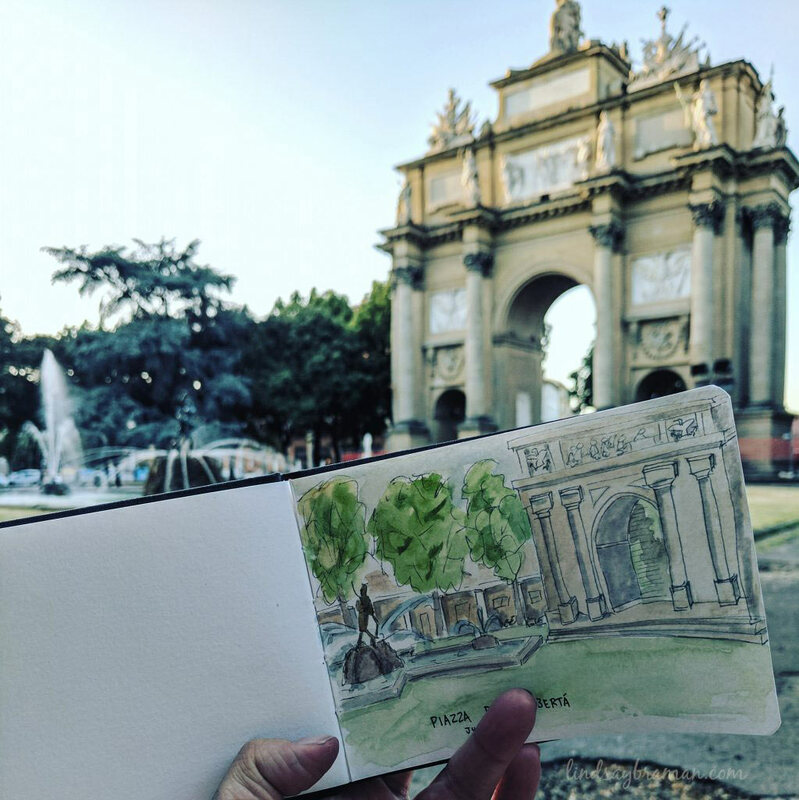 Printed photos add imagery to a journal and are easy to add to your journal during periods of travel (such as trains or buses) when vibration makes sketching or even writing impossible. COST TIP: This printer isn’t cheap, so to fit within my budget, I purchased new then sold the printer on eBay following my trip. Total cost including paper: Less than what I would have paid for a photo book following the trip! printing a photo of the scene I painted helped me see how my style of art filters landscapes uniquely. 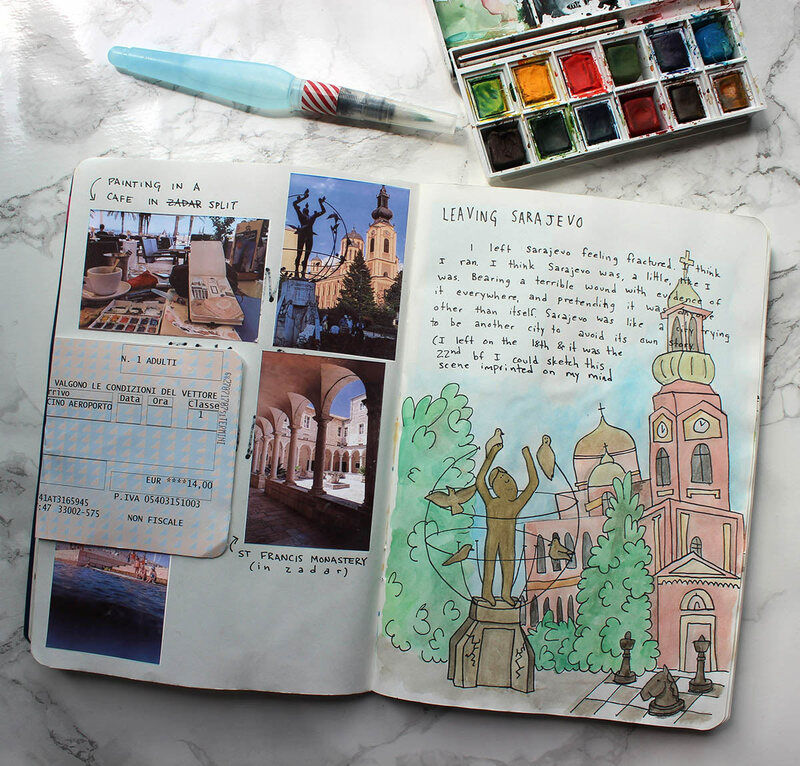 If you haven’t tried watercolor pens, travel is the best excuse to get your hands on some. 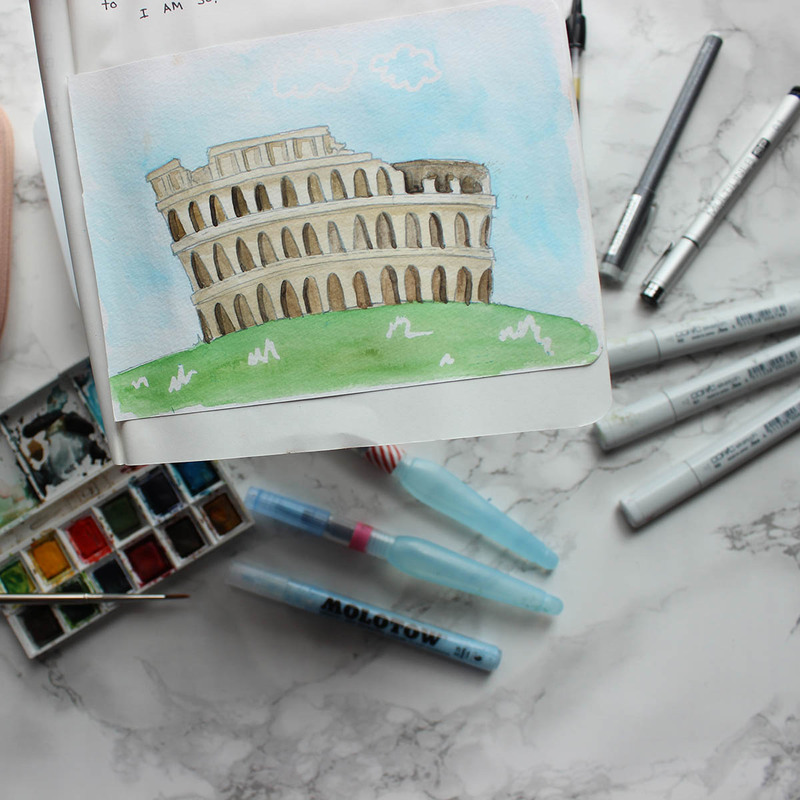 For 100 reasons these are my favorite brush for travel watercoloring, but here’s reason 101: These pens make it easy to paint using natural water sources. I love knowing that my paintings of Plitvice Waterfall Park in Croatia were painted with water dipped from one of the blue pools of Plitvice, my self-portrait in the Adriatic sea is painted with salt-water taken from the sea, and my paintings of the monuments of Rome were painted with a pen filled from one of Rome’s iconic aquifer-fed drinking fountains. Pentel’s watercolor brushes have different tips, but identical bodies. To tell them apart I use washi tape. I like having one very fine tip pen (.1mm nib) for adding fine line details like hair or wood, and I enjoyed on my most recent trip having a grey pen for a more subtle look in my watercolors. Grey rather than black ink outlines helps paint take center stage (not lines). Non-essential if you have a watercolor kit, I still like my Copic grays. They can be used in place of watercolors or combined with watercolors once dried (since Copics are alcohol based and watercolor is watercolor based, they won’t smudge each other). Grey shaded art markers make it SO simple to add depth, and have a transformative effect, especially on architectural paintings. When watercolor washes dry, grey alcohol-ink copics can be used to add depth with a bit more precise control.